I am obsessed with lemons. So much so this weekend when I was out picking out some new plants for my patio, I seriously came close to buying a lemon plant. But I have a black thumb and I’m not sure I could grow a lemon plant in a container. Does anyone know if you can? Can you imagine how much sweet stuff I would make if I had my own lemon orchard? As it is, this is the second lemon dessert in a week! For now I’ll settle for picking up a few lemons every time I go to the store. 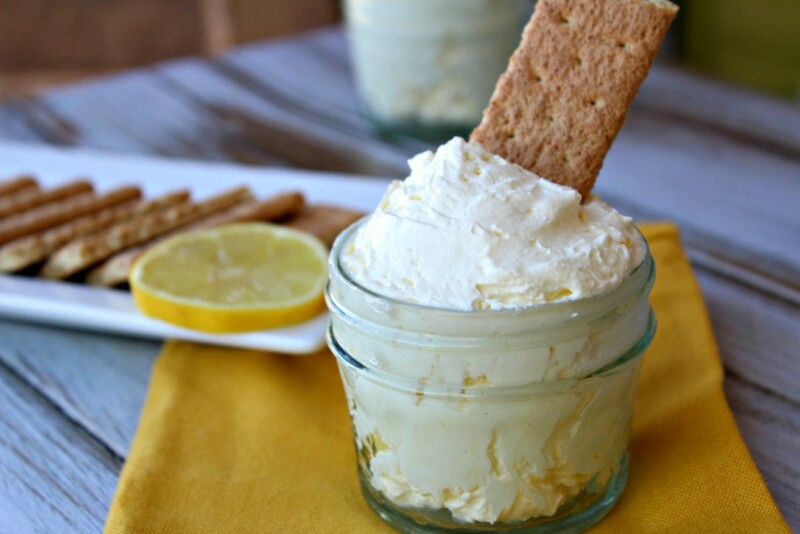 And making desserts like this Lemon Cream Pie Dip. It was supposed to be more like a Lemon Meringue Pie Dip but I just couldn’t put meringue on top knowing it would get gummy and hard to scoop up. This sweet treat would be good with chips made out of pie dough too. Yum! And I promise no more lemon desserts for at least two weeks. In a medium bowl, using an electric mixer, beat together all ingredients except Cool Whip. Mix until combined. Add Cool Whip and beat together on low until incorporated. Chill in the refrigerator for a couple of hours. Hope y'all like it Peggy.